One of my favorite memories as a little girl was searching for edible plants in our backyard and making a salad. I owe the idea to a kiddie book I once read. I remember it was about Raggedy Ann and a backyard picnic with her friends. As a little girl, this idea of a backyard picnic made me want to explore my own backyard. I do not recall what plants I found and ate other than young tender dandelion leaves. I guess I also used mint that grew everywhere in our backyard. I really wish I had kept a journal back then. I do remember the Honeysuckle plants and flowers with fondness. Nothing better than carefully pulling the bottom of each Honeysuckle flower out and enjoying the sweet nectar that clung to that stem. My friend Alexandra is responsible for bringing back these memories. 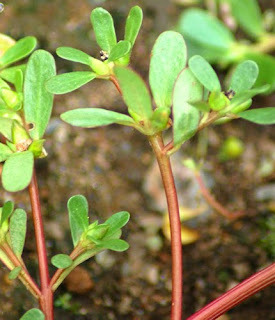 In the article she shared Food Foraging: Finding and enjoying wild edible plants they feature Purslane. This plant or as I would have referred to it... weed...still grows in the yard of our family home in New Jersey. I had no idea it was edible. However, it does explain why a lady from somewhere in central America would often ask my mother to share some with her. My mother happily obliges each time. Some of the other plants I remember growing in our backyard were not necessarily those I ventured to try eating... for instance Pokeweed. I believe we called it Pokeberry. Mulberry trees also grew all over the yard. They grew quickly and became large fruiting trees. We did not really like the taste of Mulberries as kids. Wild Grapes was yet another plant that grew in our yard and another one we did not like to eat. It was mainly because we had the most delicious Green Apple, Rainer Cherry and dark red Cherry trees growing in our yard that the wild ones were not eaten. We also had a pear tree and a peach tree but I do not remember their fruits being as sweet as the aforementioned ones. If we did not have those wonderful fruit tress, I think we would have found the wild berries and grapes to be tasty to eat. Ha, I just found this post. Thanks for the link. We have huge poke berry bushes growing in our yard this year. I had been puling them up, but then I decided they looked kind of nice. The birds eat the berries, so it's nice for them. I've always been tempted to try it.